When Josephine Bliss approached the Foundation in 1989 to create a fund in memory of her parents, it was consistent with the way she lived her life – considerate, intelligent and meticulous. “The whole family was committed to Hamilton. For them, there was no alternative to the city, ” recalled Geoffrey Mitchell, a friend and colleague from Miss Bliss’ days in research at the MacLean Hunter in Toronto.” Jo was close to her parents. When they were terminally ill, she moved back to Hamilton and commuted to Toronto at 5:30 each morning. She had a vivacious personality and a lot of friends wherever she went. She showed great courage in her own fatal illness and never complained, “Mr. Mitchell added. 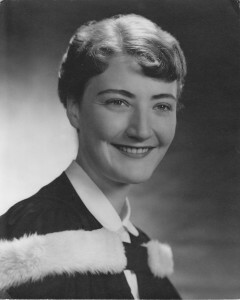 Although her parents hoped she would join the insurance agency they founded in 1944, Miss Bliss decided to attend university and pursue her own goals. After graduation, she began a career in research which first involved complex analysis of consumer magazines published by MacLean Hunter, then consumer products research at Nestle and readership studies for Chatelaine and Southam Business publications. Her talent for organization and thoroughness was evident in every assignment she took on,” Mr. Mitchell noted. Josephine was a talented photographer, pianist, animal and bird lover as well as a volunteer with several organizations including the Foundation where she assisted with many site visits of grant applicants. To commemorate the family’s devotion to the Hamilton community, Miss Bliss established the Dorothy and Frank Bliss Fund, leaving the residue of her estate to the Foundation.